Handcoloured etching with aquatint of a south view of Calcutta taken from the Glacis of Fort William by William Baillie (1752/3-1799) plate 10 of his 'Twelve views of Calcutta' published in 1794. Calcutta was founded by Job Charnock in 1690 on the east bank of the river Hooghly, a tributary of the Ganges. In the 18th century, Calcutta was known as 'The City of Palaces' due to its the impressive array of public buildings and private residences. 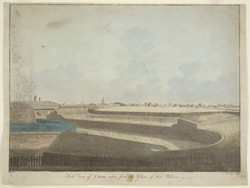 The new Fort William, seen this view, was constructed as a result of the damaging attack on the original fort by the forces of Siraj-ud-Daulah the Nawab of Bengal in 1757. It was situated to the south of the city in Gobindpore and designed by John Brohier. The structure is polygonal in form and has extensive defences including bastions, earthworks and a moat. In addition to this, the area surrounding the fort known as the Maidan was cleared to provide an unrestricted line of fire.